Edmonton Transit System's (ETS) Route 747 is an express bus service that runs every half hour between EIA and the Century Park bus and LRT station, providing superb transit connections across the city. This bus service runs every day of the week starting at 4:10 am from Century Park and 4:34 am from EIA. THE BUS STOP FOR THIS SERVICE IS OUTSIDE ENTRANCE 2 ON 25TH STREET EAST AT THE PREMIUM OUTLET COLLECTION EIA. One-way trip: $5 cash or you may also use 2 ETS bus tickets one way to ride to/from the Airport. WHERE CAN I BUY PASSES AND/OR TICKETS? You can purchase monthly passes and strip tickets at the EIA Ground Transportation Booth, which is open 24 hours a day on the Arrivals level by Door 7. Passes are sold from the 22nd of every month until the 8th of the following month. EIA: Outside Door 8, Arrivals Level (between Tim Horton's and the Mac's convenience store) See map on the ETS route brochure. All Route 747 buses are equipped with free wi-fi. In order to ensure a safe and comfortable transit experience, all passenger luggage** must be placed in the luggage racks. No passenger luggage is allowed in the aisle. Route 10 is a new route operated by Leduc Transit that will travel from Leduc (Alexandra Arena) to the Leduc County Centre, Premium Outlet Collection and the Edmonton International Airport. 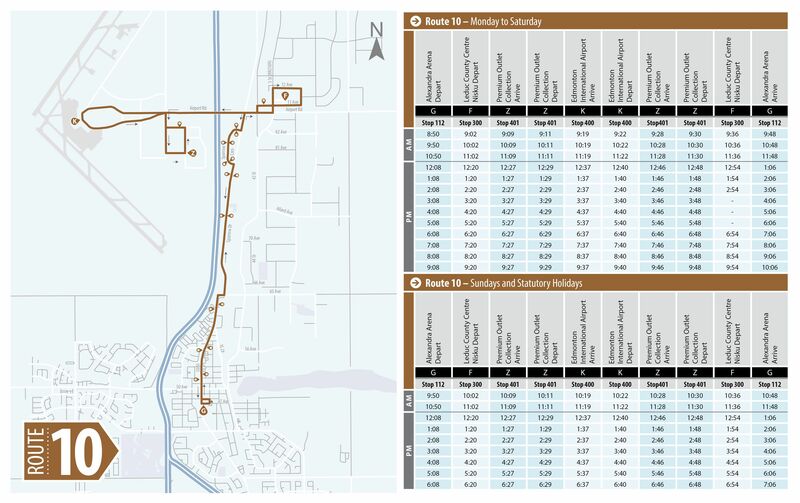 Route 10 also provides connection to EIA’s free shuttle On-airport Transit that stops at various businesses on airport lands. Riders may transfer between Route 10 and ETS Route 747 with purchase of a special $5 one-way transfer or with valid U-Pass. Riders will be also be able to transfer to ETS Route 747 with a monthly Commuter-Plus pass.